Though there are thousands of unspoilt islands to explore the world over, the allure of Maldives remains strong for both travellers and hoteliers. With back-to-back hotel openings set to continue through 2019, competition is getting stiffer. To stand out from the pack, some brands are upping the ante by providing Instagram butlers, setting up a skating rink in time for Christmas or building the world’s first underwater villa at $50,000 a night. Joali Maldives has plenty of unique selling points, so to speak. 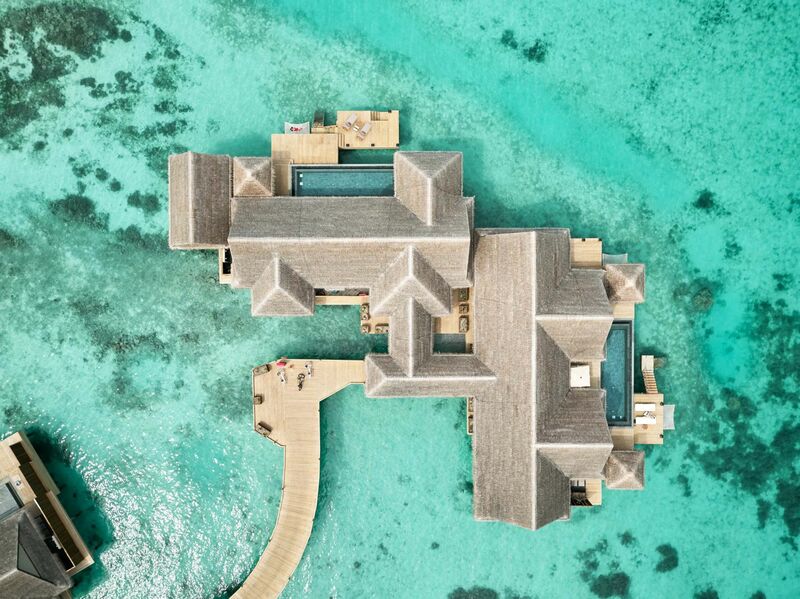 It is the first and flagship property of the newly-minted Joali hospitality brand; it has the longest—and prettiest—jetty in the country; and, thanks to its Turkish owners, it offers the only hammam in the Maldives (more on that later). Although it knows how to make a big statement, Joali is a hotel that invests in the little things. Every piece of paper is beautifully designed and embossed with copper foil and even things as mundane as hangers are given a magic touch. One hanger read "This suits you"—showing the level of detail and the lengths they'd go to make their guests smile. Located on the Raa Atoll in northern Maldives, getting to Joali requires a 40-minute seaplane transfer or a short domestic flight. I’ve heard plenty of praise for their exclusive seaplane lounge but due to my flight timings, I opted for the domestic flight instead. Upon arrival, the friendly Joali representative escorted me to the business lounge to await the 35 min flight aboard Maldivian airlines. Though the layover time was tight, he was able to secure front row seats on the plane. Let's say I took that as a sign of good things to come. I landed at Ifuru airport at midnight and was welcomed by my jadugar (butler), Sameen. A quick speedboat ride later, a leg soon to be done on a luxury yacht, I found myself on the jetty shaking hands with the affable GM Steven Phillips under the moonlight. Once I entered my villa, I found a delicious bowl of soup and a chilled bottle of Ruinart champagne waiting on the coffee table—just the midnight snack I didn’t know I needed. Excited to see the resort in the sunshine, I tapped the room's iPad control and my blackout curtains parted to reveal the quintessential view of endless blue. I stayed in Room 25, an overwater villa with pool, which measures a generous 240 sqm comparable to top tier rooms at other hotels. Designed by acclaimed practice Autoban, the interiors are the picture of tropical opulence: the shower is clad with malachite-hued marble, doors are made of intricately carved solid wood, and metallic finishes and trims exude a sense of glamour. Aside from being an aesthete's dream, the space is also intelligently laid out. The interior takes up 100 sqm, with equal footprint devoted to the bedroom and living area on one side and the bathroom on the other. For me, true pampering requires an ultra-spacious bathroom and Joali's open-plan bathroom with standalone tub surely garners top marks. The outdoor deck has everything under the sun—there are various nooks to tan, nap, read, eat, meditate, and swim. The best spot? The hammock, which can also serve as jump off point to plunge into the Tiffany-blue waters. The Joali brand is all about the “joy of living” and they truly encourage guests to indulge in what makes them happy. The first day, I rode the hotel bike and cycled across the 1.3 km-long jetty and explored the rest of island. I found a charming tree house, which, in my opinion is the best place to take in the view. While one can master the art of doing nothing, active types are also catered for here. I went snorkeling with a marine biologist, my companion took the jet ski out for a spin, and we strolled along the sand bar at sunset. Of course, the resort is also optimised for those seeking pure, unabashed relaxation. One can spend an entire day at the Joali spa by ESPA, which has a wide range of treatments on offer and a variety of treatment rooms to match what's on the menu. One not to miss? The remarkable monochrome hammam, a first in the country. For a resort with 73 villas, Joali has plenty of drink and dining outlets to entertain guests. Breakfast is best enjoyed at the airy Vandhoo restaurant, which serves Southeast Asian, Mediterranean and Levant cuisines. If you're in a celebratory mood, perhaps a Bollinger brunch right in the villa would do the trick. Wherever you start your day, order the Maldivian breakfast at least once as the local dishes are well worth trying. The highly Instagrammable Mura bar is the most versatile venue, perfect for a light lunch, afternoon snack or a sundowner. I highly suggest getting the sumptuous Tandoori wood-fire pizza and scoring a cabana or pod by the shore. Fine dining options include Saoke, a stunning Japanese restaurant with teppanyaki grill. Designed by Noriyoshi Muramatsu, the architecture is truly impressive and demonstrates Joali's uncompromising approach to providing their guests the very best. Unlike other honeymoon-centric resorts in Maldives, Joali is designed for the entire family. If you’re going on a multi-generational trip, book the Private Ocean Residence or Private Duplex Beach Residence. Both spanning 500sqm in size, they have several rooms that can house—and satisfy—even your most demanding family member. The former comes with an on-call dhoni (local boat) and the latter has a 24-hour buggy service to ferry your family in style.